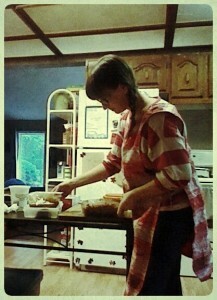 I have gotten into the groove of doing the dishes as soon as the kids leave for school in the morning. As it has turned into a habit I have stopped missing my dishwasher so much. I can begin to understand why my mother has always refused to have a dishwasher and claims to ‘like’ doing dishes by hand. Minutes after kissing the kids good bye, waving and calling out “Je t’aime”, the door is shut and my hands are in the warm soapy dish water, without thinking about it. 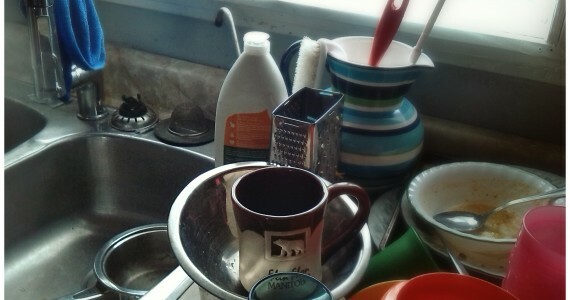 While I can not say I am at the point of being super grateful and positive about the mountain of dishes I wash each day (sometimes 3 times a day) it has provided me with some time to think, pray, listen to a sermon, enjoy an audio book or practice some French with the help of the lessons on cd my husband bought me. The hands are busy but the mind is ready to wander. Many days the wandering is purely aimless. Other days I wrestle with the newest life change and work out some resolutions to do things differently. Such a deep moment, while up to my elbows in dish soap, is what this post is about. Dishes brought me out of an escapism slump where I plugged in thoughtlessly to a daily circuit of social media, followed by streaming tv, then texting and repeat. For those well off enough to have access to constant entertaining screen time now a days do we ever get time to freely think? I find if I don’t take time to do some thought collecting during the day I am going to be kept awake, by my mind, at night. I imagine my brain is pleading with me to just take the time to unravel all that it has collected during the day. If I have been thoroughly plugged in for a while doing the dishes equates silence and silence equates time to think and for the first while that feels almost painfully uncomfortable. I do not believe I am unique in experiencing this ‘coming off entertainment’ sensation. The rewards of resolving to include daily unplugged time in life can be subtle but are also delightful. It is no secret I practice enjoying the ‘little things’, but as my kids have gotten older and I have more time to myself I have not actually been trying so hard to spot the small stuff that so often help me find thankfulness in life. The kids say less obviously cutesy things and do less obviously adorable things… they need more privacy now and that means I need to share less on social media and in my ‘in person social circles’ in regards to them personally. All of this is a good thing… with one side effect… a new stage of mommy loneliness. In my case, being physically less able to go out and have adult interactions was part of having 4 little ones. Most people can equate being a new mom with feelings of being alone, even though you’re never actually alone. A crew of kids accompanied my every move! The solution for me involved mom and baby groups at a local church, as well as actively recording and sharing the good moments (to look back at during the bad moments). This time of life has passed for me. Now I have less I can and should say about my children’s personal lives as they are very very much their own persons already. Baby mommy groups aren’t where I am going to get peer connection anymore. The crew of kids no longer go with me as a big group EVERY WHERE I GO. So mom’s of older kids can feel alone too… are often literally alone more… Every new stage is going to have a great excuse to fall into loneliness and loneliness is an excuse for escapism… but the more I escape the more little things I miss. I came to this realisation in the young mom stage and decided to check in so I had no regrets once that stage was over and I resolve to practice this through this young adult stage as well. It is not hard to find awesomeness in this stage, once you are looking for it. My kids still need me! They still need me present, in their lives, and available to talk with and love them. Perfect example is the picking up after; does that ever really go away?? Cleaning up the dining room the other morning I found my eldest son’s sweater on the floor. Picking it up I was flooded with thankfulness that he specifically is in my life, leaving sweaters all over the place… thankful he has warm clothing in our frozen province, thankful that the sweater was a hand-me-down and that meant folks in the community wanted to bless us and invest in our families welfare. And then I just thought about him; how wonderful he is, how I still think he is cute, how very funny and helpful he is. Finally I thought about how he is still under my roof for a while, to pick up after sure BUT best of all to still pour love and time into. Later as I gathered up several pairs of yesterdays socks from all corners of the house, all rolled up into balls and covered in dirt and dust, I laughed about how every one of my kids inherited this habit from their dad! I recalled how in the last house they all still did this the minute they got back into the house but we had made a compromise in that they contained their sock collection to a spot behind a door at the top of the stairs. Easier for mom to collect them for the laundry that way, or for them to put the same socks back on to go outside again. I enjoyed that memory, especially as I looked at how massive their feet are now and recalled how tiny the socks used to be. It is okay to delight in the ordinary. In the right state of mind none of my daily life can be called mundane (lacking interest or excitement; dull) as it is all full of worth. Worth and purpose are in every task performed out of love… that husband, those four kids and two pets are lovely to love. Do you recall your Mother liking a particular ‘mundane’ household chore? Did you ever ask her why? P.s. Just so you know, being thankful for this lesson in life doesn’t mean I am not also hoping for a good enough tax return to get a new dishwasher! One Comment on "Thanking God The Dishwasher Broke!" You say it all so well. Brings a tear to my eye just remembering my years of this. I love you.